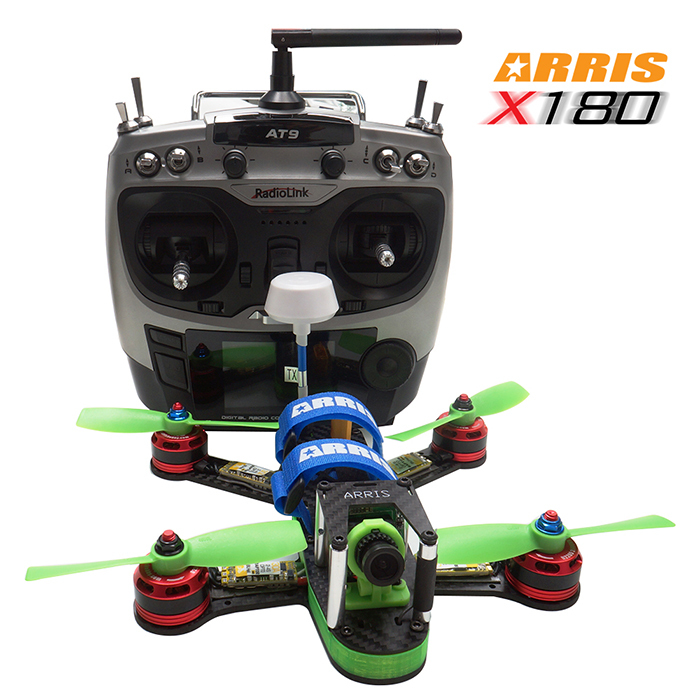 ARRIS X-Speed X180 is the latest and smallest drone of ARRIS X-SPEED series,the wheelbase is only 180mm.ARRIS X180 frame is made of pure carbon fiber material, the assembled drone`s weight (without battery) is 305g. 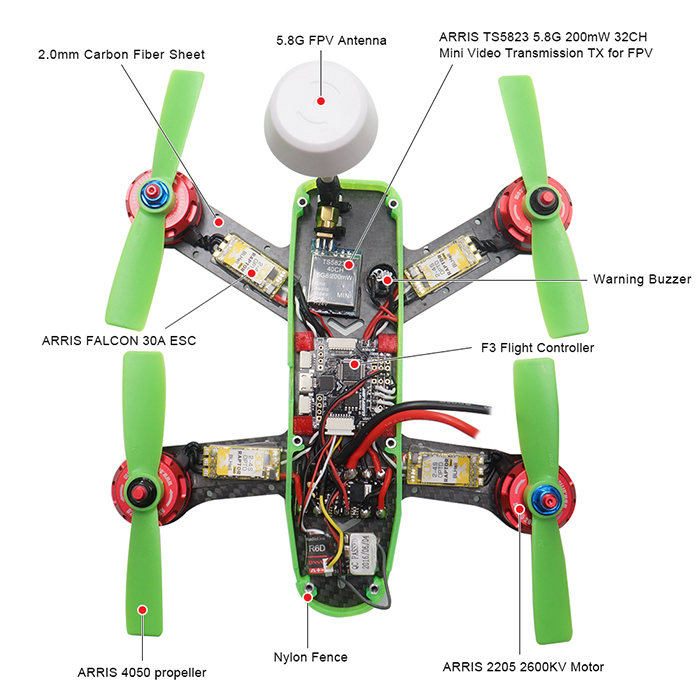 With the ARRIS 2205 2600KV brushless motor, ARRIS Raptor 30A ESC,4050 propeller on the X180, it is incredibaly fast. 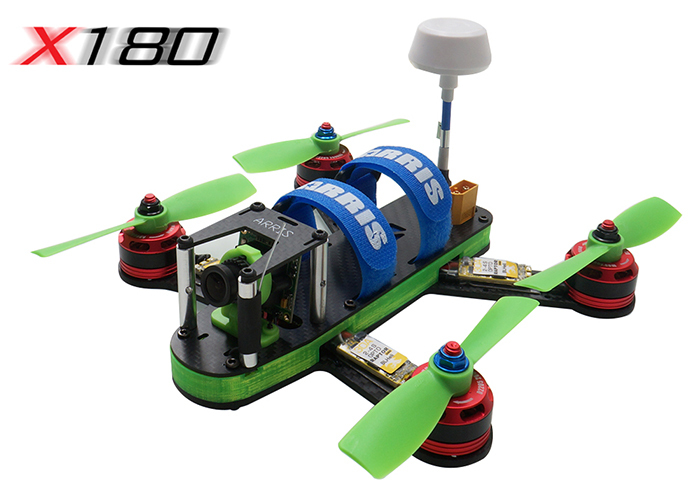 Small Size,Light Weight, Strong Powerful, Fast Speed, this is ARRIS X-Speed 180 FPV Racing drone. 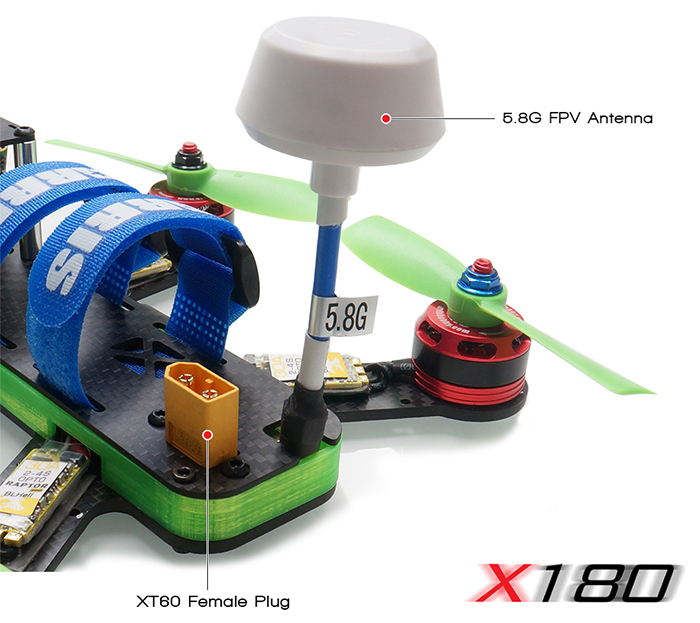 If you pursuing a speedy and powerful fpv racer, the X180 is your best choice. The digonal wheelbase of the ARRIS X180 is only 180mm, much smaller than the 250 or 280 racers. 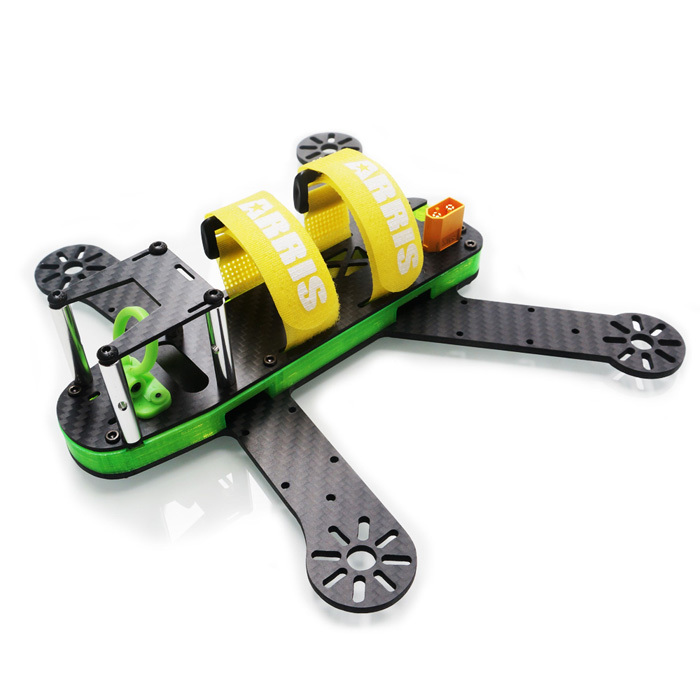 And the ARRIS X180 frame is made of carbon fiber material, the assembled drone`s weight (without battery) is 305g. For the mini racers, to repair it is really complicated before. When we design this quad,we consider this situation, so the ARRIS X180 frame is very simple and strong. If you need to change some equipement on it, it will be much easier. 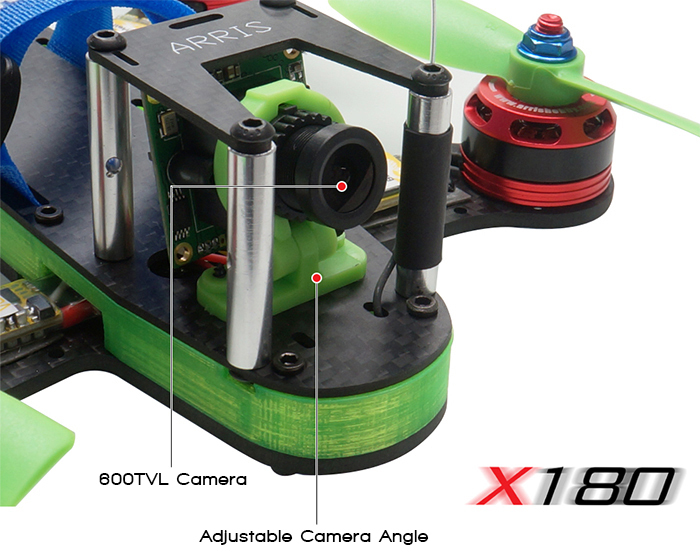 Comparing with the 210 and 250 drone, the wheelbase of X180 is smaller, but the power couldn`t be weakened. 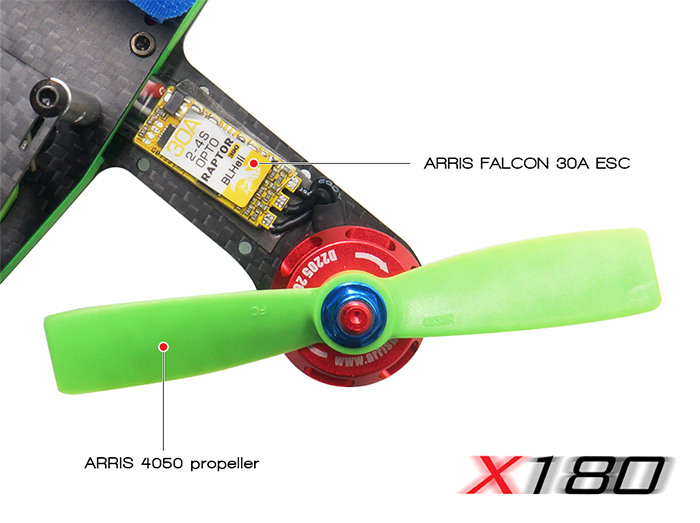 X180 equipping with the latest ARRIS Falcon 30A ESC, it can offer better power output and faster response.X180 is assembled with the latest ARRIS 4in 2-blade propeller, which can perfectly work with the 2205 motors. With this setup, the X180 would have better performance. We joked that this ARRIS 4in propeller should have let us cry, because it is too strong to damage, even after a heavy crash, it is still the same, no bent, no broken. What can we say? This will save customers much on purchasing the spare propellers. 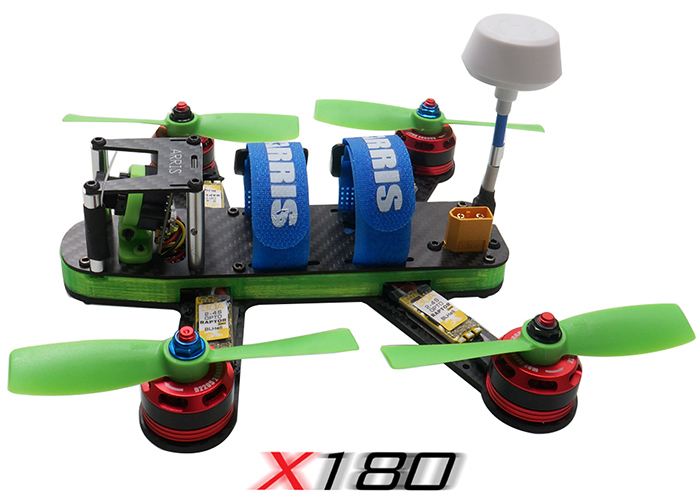 X180 comes with ARRIS 2205 2600kv brushless motor and ARRIS Falcon 30A ESC and F3 flight controller, so the power for it is really strong. Move the throttle, you could experience the fast racing it brings to you. X180 is designed with lower CG and the battery installing plate is sunken which makes the installed battery is in horizontal with the camera. Such kind of design ensures beautiful appearance, reduces the wind resistance and at the same time, the lower CG design will make the racer be more agile when doing the 3D rolling. X180 has pre-installed with a 5.8g 200mw video transmitter, featuring strong signal transmission and long distance transmission. With the adjustable camera angle, pilot can adjust the angle of the camera to obtain the best angle simply and conveniently. X180 has integrated with a remote controller battery warning buzzer, pilot can set the threshold (adjustable) according to CF parameter-adjustment software. In addition, you can also locate your racing drone through triggering the buzzer with the switch D on the transmitter. So much fun and very fast. This is my first race quad and I love it. Handles great and did I say it was fast...it is!